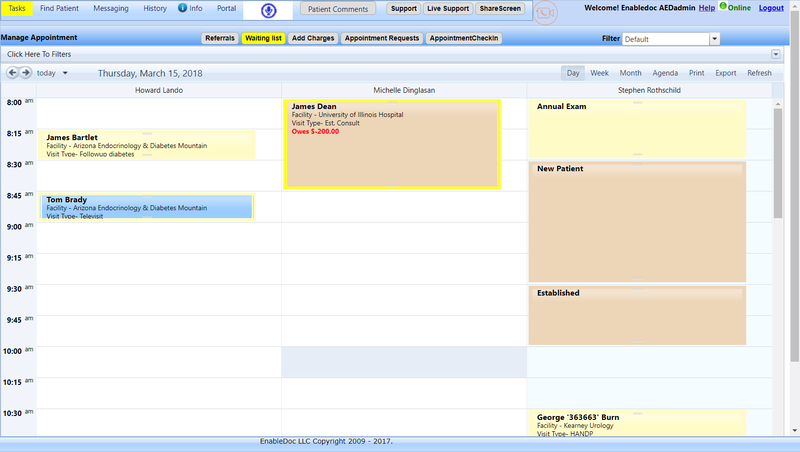 Patients/Clients can book appointments from your website showing only available times by provider, or office. Services and classes can also be booked and paid for. Televisits can be booked and paid. Staff are alerted to online booking and with a click can confirm or suggest other appointment times. Display by provider or office with daily, weekly, monthly and agenda views. Group providers and offices in views. Save multiple views for each employee to quickly switch calendars. Set text and color of visit types and status. Settable slot times and height as well as reserve slots. Appointments can be dragged to other days, times, providers and offices. Appointments can be copied and pasted. Book appointments and recurring for providers, rooms, classes, and services. Insurance benefits can be automatically checked and information is displayed via the appointments. With a click payments can be taken and processed with a credit/debit card. Statements and superbills can be easily printed right on the calendar. Clicking on an appointment allows notes to be opened, claim data to be entered, prescriptions to be written, notifications to be sent, and insurance information to be updated. By provider, breaks, blocks, and reserved slots by visit types can be saved. Working hours can be saved by date range. Waiting lists are easily converted into appointments. Other certified EHRs send CDA files turns the referral button yellow. With a click, the patient can be added and an appointment scheduled. Clinical data can be imported or reconciled into the EHR.